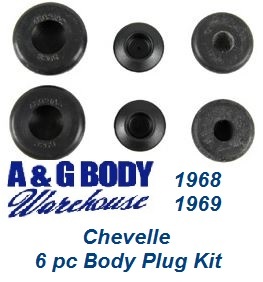 6 piece body plug set packaged for 68-69 Chevelle. Technically correct reproduction body plugs include numerals and text embossing as original. When restoring your car it is the little things that make the difference, replacing 40 year old worn or missing body plugs is an important step in a proper restoration.